“To the dreamer and midnight thinker Moscow is dearer than everything in the world,” wrote Boris Pasternak, whose name is as closely bound to the city as Fyodor Dostoyevsky’s is to St. Petersburg. Academics and devotees have studied every last dot of the Moscow map in their search for links with the poet and author of “Dr. Zhivago.” A special place is held by one essential route on the Moscow tourist trail through Tverskaya Street and surrounds. If you exit Mayakovskaya metro station on Tverskaya-Yamskaya Street, you will walk several feet along the cafes before noticing a yellow three-storey house at Oruzheiny Alley 3A. Not that the author would have had memories of the house, as his family moved a year later to a nearby property owned by the merchant Lyzhin at Oruzheiny Alley 42. The building has long gone and in its place runs the notoriously congested “Garden Ring” road. The name Tverskaya-Yamskaya refers to the settlements of state coachmen (“yamshiki”) who worked the postal service horses. This area, well known to the writer from childhood, features in “Dr Zhivago,” where Komarovsky rents a room for Madame Guishar and Lara in the Montenegro Hotel in Oruzheiny. Continue along the Garden Ring to Delegate Street (Bozhedomsky Alley in Pasternak’s time), you will see the small Seminarsky Park, where he used to stroll with his nanny as a child. Turn back to Tverskaya-Yamskaya and start down towards the Kremlin. Behind you is Belarus Square, the location of Belarus Station (formerly Brest Station). We continue to Pushkin Square and turn into Bolshoi Putinkovsky Alley and walk to House No. 5. Located on the grounds of the former Strastnoy Monastery, the building once housed the editorial headquarters of Izvestia, a daily newspaper, and Novy Mir, the official literary journal. The monastery stood on the site of the current square in front of the cinema, but all that remains today is the former monastery hotel at Maly Putinkovsky Alley 1/2 where Novy Mir has resided since the 1960s. The editors had also planned to publish “Dr Zhivago” in serial form before the book was dropped for ideological reasons and the book was banned in the Soviet Union. The next stop on our tour is at Tverskoy Boulevard 25, a typical Moscow townhouse of the 18th and 19th centuries which is now occupied by the Literary Institute. In 1932 Pasternak received a first-floor apartment in the wing of this house, although he hardly stayed here, giving the apartment instead to his ex-wife Evgenia and his son Zhenya. But he was a frequent visitor. Nearby at 23 Tverskoy Boulevard, behind the Pushkin Theater, stood a café with no name but which was known as the “Café Grec” because of its design. Pasternak would meet here with friends and it was where he first heard the poem “Vladimir Mayakovsky” read by its author. 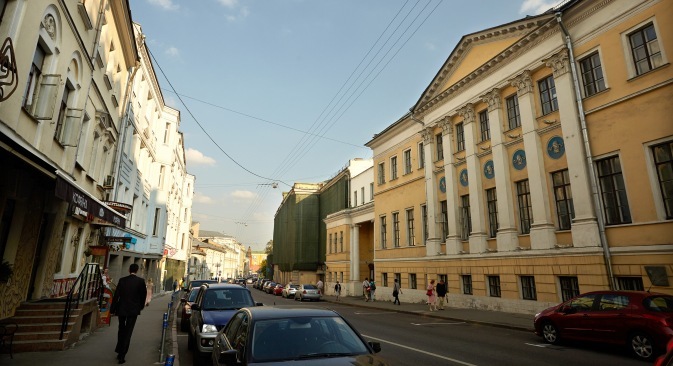 Continuing to the end of Tverskoy Boulevard we then turn into Bolshaya Nikitskaya Street, the site of the Moscow Conservatory where Pasternak entered in 1908 after finishing grammar school — there was a time when Pasternak entertained the idea of being a concert pianist. At the Moscow Conservatory, there is a lovely café in the left wing where you can sit over an expensive but well made cup of coffee and devour the pages of “Dr. Zhivago” for the many references to this street. At the start of the 20th Century, the buildings on both sides of the top of the street were part of Moscow University, where Pasternak entered the law faculty in 1908 and transferred a year later to the faculty of history and philology. Today almost every faculty of Moscow State University has moved to the site at Leninskie Gory, but some faculties - journalism, psychology, art and the Institute for Asia and Africa - are still located in the vicinity. But we will swing left and emerge once more onto Tverskaya, across which lies Kamergersky Alley. The main site here is the Moscow Art Theater, so intertwined with Pasternak’s life. It was here that Vladimir Nemirovitch-Danchenko planned to stage “Hamlet” in Pasternak’s translation, although this never came to fruition. But Schiller’s “Mary Stuart,” translated by Pasternak in 1955-56, was performed here. Kamergersky also has a special niche in “Dr. Zhivago,” for it is here that Pasha Antipov chats to Lara before she shoots Komarovsky in the room adjoining the Art Theater. And this is where “the candle burned on the table” and was noticed by Yura Zhivago as he drove by. And ironically it is here that Yury spends his final days and where Lara sees his body in the coffin. Today Kamergersky Alley is a cobblestoned, pedestrian street with restaurants and cafes for all tastes. This where our tour of Pasternak’s Moscow must end, but could otherwise go on to include the Arbat and adjoining side streets, Kuznetsky Bridge, Peredelkino and many other places dear to Pasternak as he watched Moscow grow, “though weak his heart,” with such enduring passion.